Golden is located just 12 miles from the skyscrapers of downtown Denver, but it is a world away in atmosphere. This is Denver’s closest mountain town, offering everything a mountain town should. There are gorgeous mountain views in all directions. A river offering fly fishing, kayaking and even gold panning flows through the center of town. There are more than 100 miles of hiking and biking trails, including the iconic climb up Lookout Mountain. There are colorful historic buildings from Colorado’s Gold Rush days lining a main street filled with outdoor cafes, recreation stores, bike shops, galleries and one-of-kind boutiques. And of course, this being Colorado, there are a half dozen breweries and distilleries with outdoor beer gardens and food trucks. The big difference between Golden and other Colorado mountain towns is that it is only minutes away from anywhere in Denver and it is just 5,675 feet high! So no traffic, no altitude ... and no attitude. The iconic 58-foot arch over Golden’s main street proclaims “Howdy Folks! Welcome to Golden.” And they mean it. Here are 10 mountain things to do in Denver’s closest mountain town. 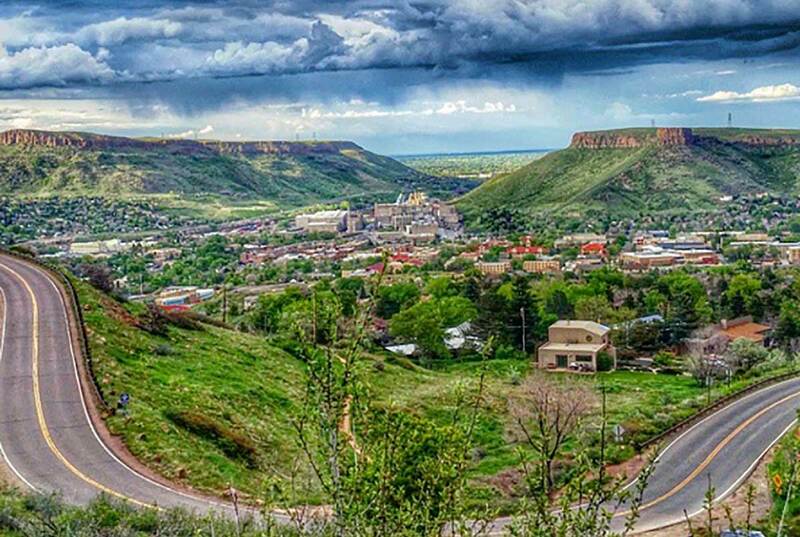 From downtown Golden to the top of Lookout Mountain is pure Colorado and boasts majestic views that stretch from Wyoming to New Mexico. It’s no wonder this road, which gains 1,300-feet in just 4.3 miles, is one of the classic bike rides in the state, featured twice in the US Pro Challenge and ridden by the world’s top cyclists. It’s also one of the state’s best scenic drives, climaxing at the 7,379-foot summit of Lookout Mountain with 360-degree views. It’s just a short walk from the free parking lot on top to Buffalo Bill’s Museum & Grave. Stop and learn about the famous Old West scout and showman, put a penny on his scenic grave and don’t miss the giant gift shop — rated one of the best places for true Colorado souvenirs. After the thrilling climb up Lookout Mountain, you might need a “restorative.” And what could be better than three free beers? 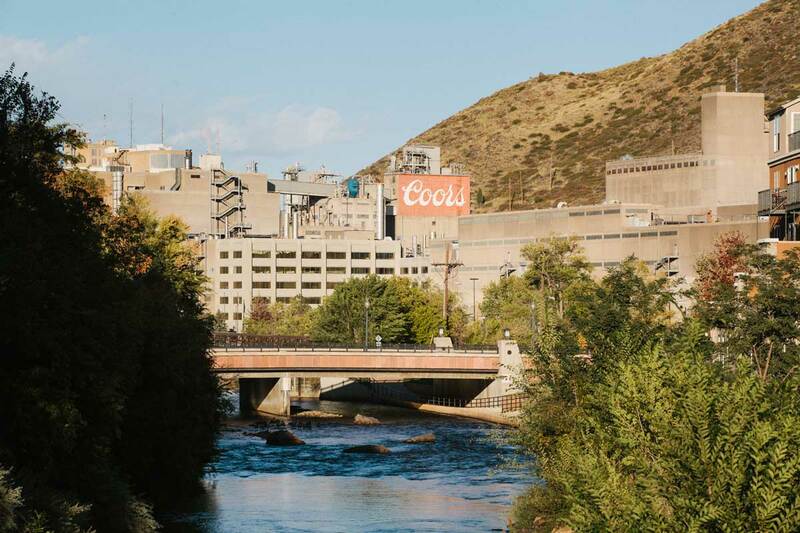 The fascinating tour of Coors Brewery (the largest single brewing site in the world) takes you past endless copper kettles and into the packaging plant and ends with a chance to taste three free glasses of their various beers. More of a craft-beer person? No worries. There are six craft breweries in Golden, three in downtown within walking distance of Coors. There’s also two dozen restaurants. Join the locals at Woody’s Pizza or stroll down to D’Deli to grab a delicious and unique sandwiches. 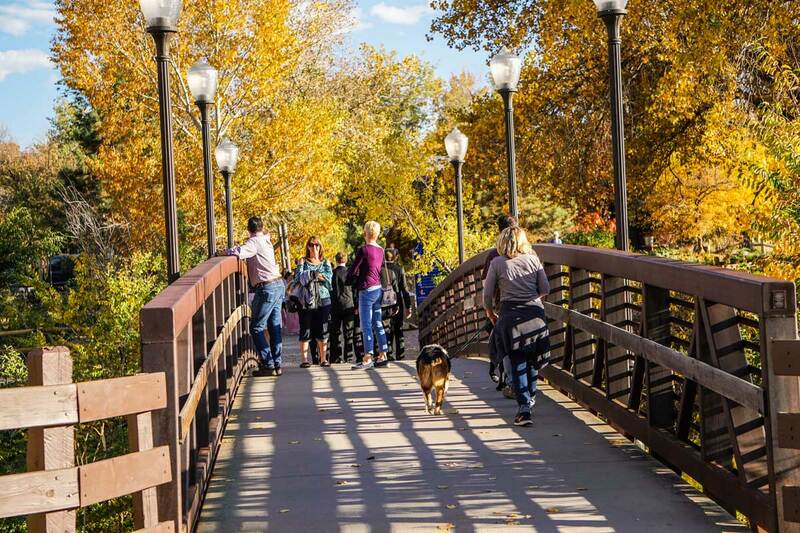 Scenic and aptly named, Clear Creek flows right through the center of Golden with a paved, all-weather trail running beside it. This gorgeous Creekside trail runs 11.8 miles east to Denver and continues west of Golden up into the foothills. 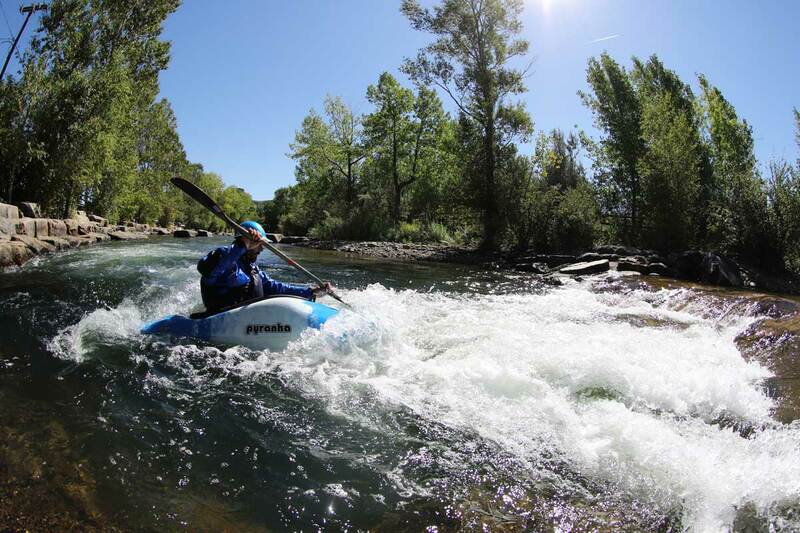 The creek has award-winning manmade whitewater chutes perfect for thrilling kayaking or stand-up paddleboarding, and the upper stretches are renowned fly-fishing spots. Clear Creek has a good population of small to mid-sized rainbow and brown trout and abundant bug life. Stop in Golden River Sports, just steps from the creek, for tips and local flies. The Golden Bike Library (located conveniently behind the Golden Visitor Center on the banks of Clear Creek) has bikes available for free two-hour rentals, Thursday through Sunday from mid-April through October. Pedal down the Clear Creek Bike Path, or try the more challenging 5-mile mountain-bike loop that circles North Table Mountain. The trailhead for this volcanic geologic mesa is just north of downtown and offers outstanding biking and hiking opportunities. Because there are few trees on the mesa, the trails are open and generally dry year-round. 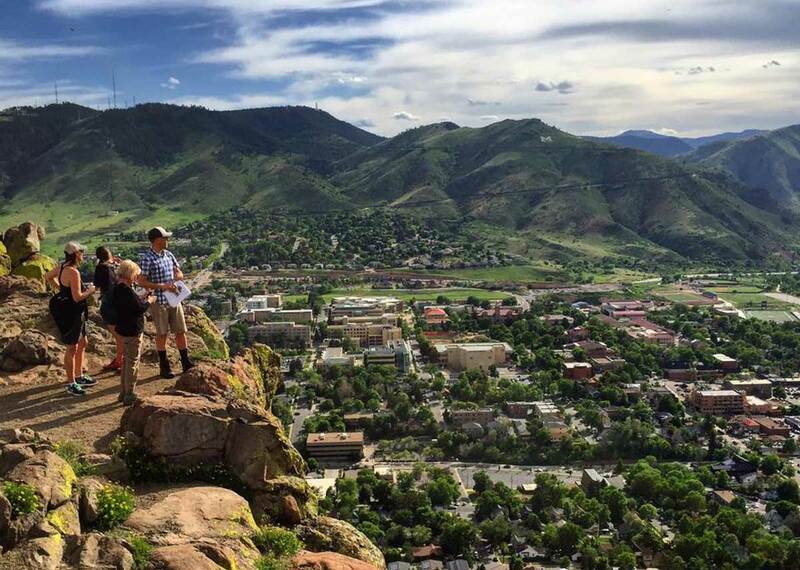 You can also hike to the top of South Table Mountain on a short, steep trail that takes you to the famous butte that appears on the old Coors logo (the brewery is right at its base). The first T-Rex dinosaur fossils were discovered on this butte. Golden was a prehistoric playground for dinosaurs. 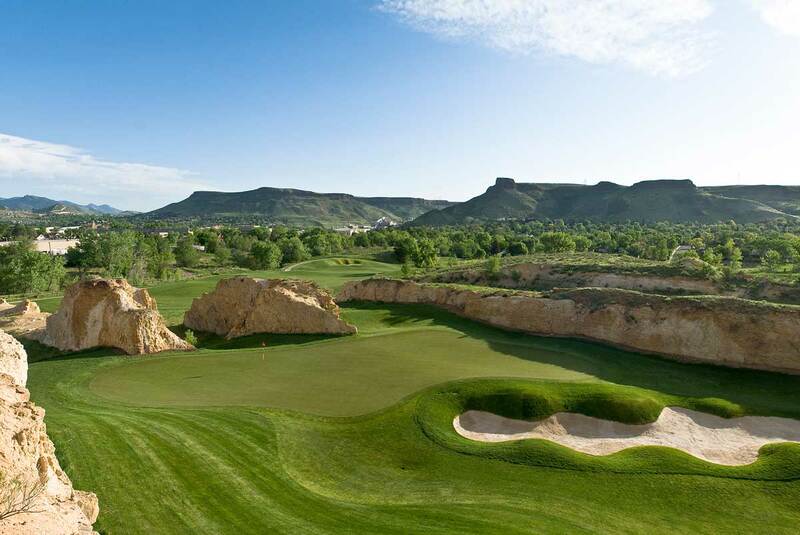 You can even see their tracks between holes 11 and 15 at Fossil Trace Golf Club, one of the most striking public courses in the state. Colorado is famous for its narrow-gauge steam railroads, but you don’t have to drive across the state to see them. The Colorado Railroad Museum in Golden has a half mile of circular track and they fire up their steam locomotives and give everyone the thrill of riding a genuine steam train all year long. The museum also has Colorado’s largest collection of locomotives and cars, a gigantic outdoor garden railroad and an amazing indoor HO model train, complete with a circus, city and mining-camp locations. During the holiday season, the Polar Express with Santa on board steams in three times a night. Golden was Colorado’s first state capital and a one-time rip-roaring mining camp. The state’s first capitol building is now a restaurant and bar — The Old Capitol Grill & Smokehouse. Just two blocks away is the Golden History Park, a re-creation of an authentic frontier homestead with a barn, farmhouse and outbuildings, all in a spectacular setting. Kids love to stop and feed the chickens. Two nearby hikes visit old farmsteads. White Ranch Park has beautiful hiking and mountain-biking trails that lead to the old farm nestled in a valley, while nearby Golden Gate Canyon State Park has many trails that pass historic log cabins. The park is also home to Panorama Point, one of the most dramatic mountain views in all Colorado. Clear Creek Canyon offers some of the best rock climbing in Colorado. It is largely known for sport climbs with some trad climbs interspersed. The rock varies from gneiss and schist to a sandy granite with a variety of ratings. Beginners head to the Canal Zone, which can be accessed by foot from downtown Golden using the farthest west footbridge over Clear Creek. Little Eiger, Red Slab and High Wire Crag also offer beginning routes to work you up to Primo Wall, Anarchy Wall and New River. And if you’ve never climbed, or just want to sharpen up, head to Earth Treks Golden. This is the premier indoor rock-climbing and bouldering gym in Colorado. The 28,500-square-foot facility has 45-foot high walls with 300 roped routes and 100 bouldering problems to twist, stretch and pull yourself over. The walls were designed by rock climbing legend Jason Kehl, the eclectic climber who was the first person to ever boulder a 5.14d grade route. The people of Golden live outdoors. And why not? With 300 days of sunshine and spectacular views in every direction, who would stay inside? So naturally (as in any mountain town) most all of the restaurants in Golden have outdoor dining. 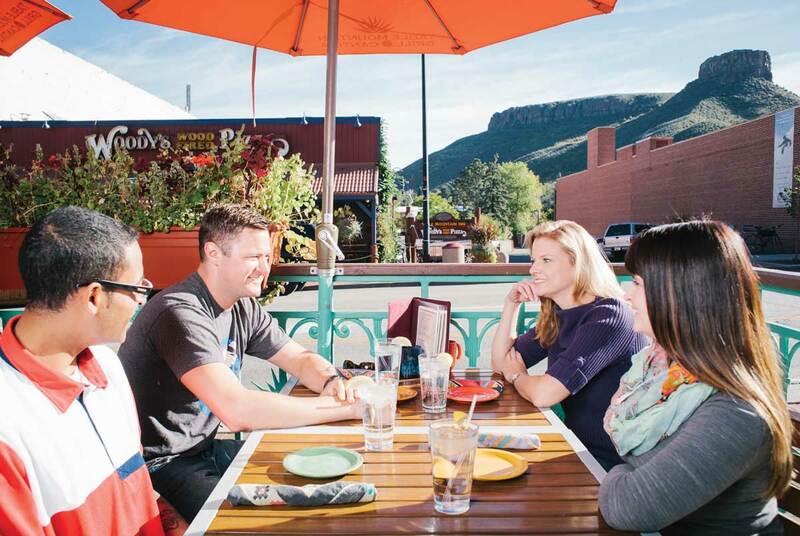 Some of the best patios include the Golden Hotel’s Bridgewater Grill, which has a sweeping patio overlooking Clear Creek; the Table Mountain Grill & Cantina, which has a flower-lined deck and a great view of South Table Mountain; and New Terrain Brewery, which has food trucks and rests at the base of North Table Mountain. The Bradford Washburn American Mountaineering Museum is the first and only museum in the United States dedicated to the heroism, technology, culture and spirit of mountaineering. Whether you have climbed a dozen fourteeners, or are just thinking about summiting your first, this is the place to start. There are exhibits about climate, the science of mountains, Colorado’s fourteeners, lightning and the history of mountaineering in Colorado and around the world. The clothes worn by the first Americans to summit Mount Everest are here, as are 5,000 other items, photos, outfits and cultural artifacts. On display is an ice axe that once saved five lives on the slopes of K2 in 1953. There is a huge model of Mount Everest, showing the many different ways the peak has been climbed, and where some of its most famous tragedies have occurred. There’s also an exhibit on the famous 10th Mountain Division, a regiment of U.S. troops that trained in Colorado to fight in the mountains of Italy during World War II. Boy, would Lewis & Clark have loved shopping in downtown Golden. They could have outfitted their entire expedition here — and more. Golden is known for having one of the greatest and most concentrated collections of outdoor recreation stores in the metro region. There are shops devoted to hiking, biking, skiing, snowboarding, climbing, fishing, camping, backpacking and hunting. But men and women do not live by outdoor adventures alone! There are also art galleries, one-of-a-kind boutiques, designer fashions and jewelry, coffee shops and toy stores — all in historic buildings along Washington Avenue under the famous arch that has welcomed visitors since 1949. Learn more and plan your trip at visitgolden.com!